All eyes are on Utena Tenjou, a mysterious transfer student to Ohtori Academy. But Utena's eyes seem to be fixed on one familiar face that stands out among the rest—Touga Kiryuu, Utena's childhood friend. Touga knows of Utena's past and possesses knowledge of the Mark of the Rose, a set of unique rings worn by those who compete for the hand of the Rose Bride. The Rose Bride, Himemiya Anthy, belongs to whomever wins her in a duel, and the one that wins all the duels is said to be given the power to bring revolution to the world. Utena is drawn into the duels, but Touga and their complicated history together may end up unraveling everything. Nothing is as it seems in this retelling of the original anime series. Honestly, I had to watch this like three times before I had an inkling of a clue what this anime was about. I was not familiar with the Utena series before, and I ended up watching the movie because I was informed that it wasn't the same as the series. So I watched it and wondered what sort of crack I had smoked before popping the DVD in. Apparently, I had not smoked any crack, and it was just Utena that was messing with my head. The story is...I don't know. Up to now, I hardly know what happened. It's long, convoluted, and they don't ever, EVER explain what the hell happened. Well, they sort of did, with visual symbolism. But I'm sort of dumb in a fabulous way, so I barely understood any of that. The art and animation was top-notch though. It looked incredible. The sound was great too. Characters were...interesting, to say the least. I was pretty certain that at least four people in the main cast were homosexual, or maybe it's just all the flower imagery that threw me off. I didn't enjoy this movie because I spent the whole time tugging at my marvellous hair wondering 'WTF?!' is going on. It's not unfabulous, and it's worth a watch, I say. Adolescence of Utena is a feature-length movie that was produced and directed by the same persons who were responsible for the TV series. It premiered in 1999, and has been licensed Stateside by Central Park Media, which is now defunct. Let's just say it's been out for a long time Stateside. Adolescence of Utena is best described as the TV series retold in two hours or less with different plot elements bought up or discarded, with some characters absent, and lots and lots of symbolism and, some would argue, a heavy dose of crack. I would highly suggest watching the series going into this. I watched this first, then watched the series, and then watched this, and I found that the series helped me understand it more, which is what the creators intended with this. And then the movie, in turn, helped me understand elements of the series that I didn't before, which in turn helped me understand the movie more, which helped me understand the series... it's a cycle of positive feedback. And it's amazing. The art for this is a lot smoother than it was in the series, though it is still heavily stylized. A definite improvement. The music has a lot of the same themes, subtly reworked for the movie, which gives it a whole new feel. There are also some new vocal pieces that don't have to do with the duelling songs, and they're quite addictive. Most of the vocal cast was able to return for this, except for Akio's seiyuu, which just adds a nice touch to this. An amazing movie, and one of my favorite anime movies to date. There's one thing you should keep in mind when watching Adolescence Apocalypse: absolutely EVERYTHING is a metaphor, usually for some part of adolescence. This is a movie that was made to be analyzed. Usually I don't analyze the symbolism of anything I watch, but Adolescence Apocalypse makes analyzing symbolism fun, crazy as that may sound. As for as anime symbolism goes, Adolescence Apocalypse can't be beat, even by the series. That's not to say the symbolism's the only thing worth watching the movie for. Every moment of screentime is purely entertaining, whether symbolism is the focus or not. The only real complaint I had with the TV series was that some episodes felt repetitive and didn't seem to contribute much to the main characters' development or the overall plot. Here, however, every fight scene, every conversation, everything really matters. The movie is not content to simply have a fight: at the same time the fight is going on, there is development for Utena, Anthy, whoever she's fighting with, and even background characters. The backgrounds themselves also deserve a mention. The school puts Hogwarts to shame, as it's constantly in motion, and there's always something interesting to look at. Everything is constantly in motion, and while this is partially for symbolism, it helps to make the series very pretty. Though some of the reviews complain about the music, I had no problems here. Absolute Destiny Apocalypse is as awesome as ever, and the rest of the music is also great. Perhaps not as wonderful as in the series, but still very fitting. Other than the symbolism, the main draw of the movie is the characters. Utena herself is even more magnificent than in the series, simultaneously vulnerable and strong. And not vulnerable in the way typical strong anime females are often vulnerable, but in the way you'd expect any middle school girl to be. That vulnerability causes problems for her at times, but she deals with it in an appropriate and realistic way, as it contributes nicely to her development. Utena's relationships, especially with Touga and Anthy, are all interesting as well, as they help her grow in interesting ways throughout the movie, and their interactions are always clever and witty. As a final note, I should add that this movie works best when you've seen the series first. Almost nothing is the same as it was in the series, but a lot of the minor characters are better understood with the series' development behind them. If you've watched the series, the movie is a splendid treat. Knowing the TV series isn't required to watch this movie, but it definitely helps a lot to catch some references and to understand part of the relationships better, even though, there are lots of changes in characteristics. If you haven't seen the series, be prepared to be blown away by some of the most bizarre moments in anime history. The basic storyline doesn't give too much hints of what tragedies will be revealed. Utena is at first believed to be a boy, a little glimpse on the problematic gender roles. 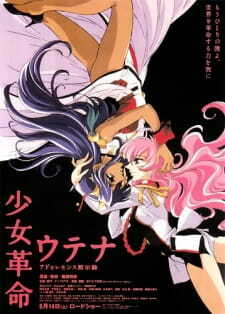 Don't just watch this, because somebody told you there'd be girl kissage, there's so much more to Utena and Anthy. As opposed to the more devote Rose Bride in the series this Anthy has a mind of her own and doesn't act like a mere puppet. She and Utena are equal central characters and the audience gets as little information as necessary about everybody else. That's why characterwise I give 'only' a 9 instead of the full 10. Still, you can hardly put any more depth to the heroines of this piece, because their fates are similar and yet work on very different levels. Comparing the animation, the design, the colors of the movie and the series almost hurts my eyes. Where the series seems to favor pastel shades the movie shows everything in full bloom. An ocean of red roses, hair colors bathed in warm light, the building moving around as if it's breathing and rich backgrounds full of detail. Smooth movements of the characters, wether they wield a sword or just touch glass, you can almost feel it yourself. The heavy symbolism makes it hard to follow at times (and yes, there is relevance and even a certain amount of logic to the infamous car chase), but at least the art should satisfy your senses. Okay, a minor deduction regarding the sound. Even though the songs &quot;Rinbu Revolution&quot; and &quot;Zettai Unmei Mokoshiroku&quot; are there and there's a really beautiful dance sequence with a wonderful ballad (&quot;Toki ni ai wa&quot;), I really miss the powerful atmosphere of music overall. Most important word of this movie has to be &quot;oji-sama&quot; - the Prince and his many incarnations. Everybody is linked to a prince and realizing who this prince is and why this link has to be broken is essentially the growing up process the title refers to. Watching this movie for the first time was highly confusing, but this turned into pure enjoyment for me. For about an hour and a half I can dive into a fascinating world of high goals and two girls struggling for freedom and peace.